I showed up to class a few minutes before 5 a.m. Tim was already at the whiteboard, writing out today's workout. I exchanged sleepy hellos with The Marine and the Terminator, and started stretching. One by one, the others arrived, and the low hum of morning conversation filled the gym. But Tim was noticeably silent. I looked over at the board. "You can put the pen down anytime," I yelled out. He laughed and kept scribbling. Ten up-tempo exercises, each more demanding than the one before it, each requiring 50 near-perfect repetitions. Today, Petranek leads the way and finishes in 20:43 -- besting his previous record on this by nearly eight minutes -- then crumples to the floor struggling to catch his breath. Yeah, these long metcons are kind of crazy -- but they're also sadistic fun. Once you throw yourself into the workout, the trepidation and pain disappears, and you end up focusing like a laser only on the immediate task at hand. In a way, it's kind of zen. Only sweatier. I'm not saying I killed this workout. My knees-to-elbows were slow (I desperately need to work on my grip strength) and the wallball shots took forever. By the time I had to launch into my set of 50 burpees, I found that I couldn't string more than four or five together at a time. 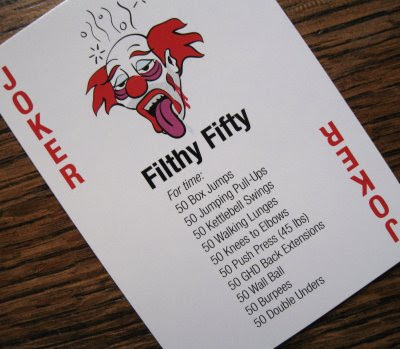 Nonetheless, I enjoyed just about everything else that "The Filthy Fifty" had to throw at us. There's nothing like starting a morning flat on your back, making sweat angels on the gym floor and laughing about the sheer ridiculousness of it all.